If life is a cabaret, capitalism is karaoke. Whether we like it or not, we are citizens of a world dominated by markets. We are surrounded by market mania and live on a planet where money is meaning. In this world where markets rule, Karaoke Capitalism is a book about people, management for mankind, the individuals prepared to grasp the microphone and express themselves. Karaoke Capitalism shows that expressing your individuality, being different, lies at the heart of the modern enterprise and modern life. We are all individuals now. The choices are ours. The music of chance has become the music of choice. The riff of our times is the gloriously eclectic sound of individualism. The riff pulls us in improbable directions – Bollywood via the Buena Vista Social Club to Britney Spears. It is as individual as we are. After the collapse of communism, the rise and fall of dot-communism and the sometimes violent questioning of capitalism, the only ism left on earth is individualism. Individualism means that more and more people throughout the world can shape their lives. Choice rules. Those with cash or competence have the freedom to know, go, do, and be whoever they want to be. The world of Karaoke Capitalism is being shaped by the glorious trio of technology, institutions and values. This trio is creating an abnormal society of extremes, a double economy of graft and grief, misery and opportunity. The winners are talented individuals and customers. Friction-free commerce is a shopper’s paradise. All this provides companies with formidable challenges. They are held hostage by competent individuals and under siege from demanding customers. To thrive, they must learn to master the art of capitalizing on competencies and customer creation. Karaoke companies look different, feel differently and behave differently. They possess a seductive story, are diversified and decentralized, possess purpose, persistence and passion and are engaged in a constant process of dialog and discovery. Join the karaoke world or perish. 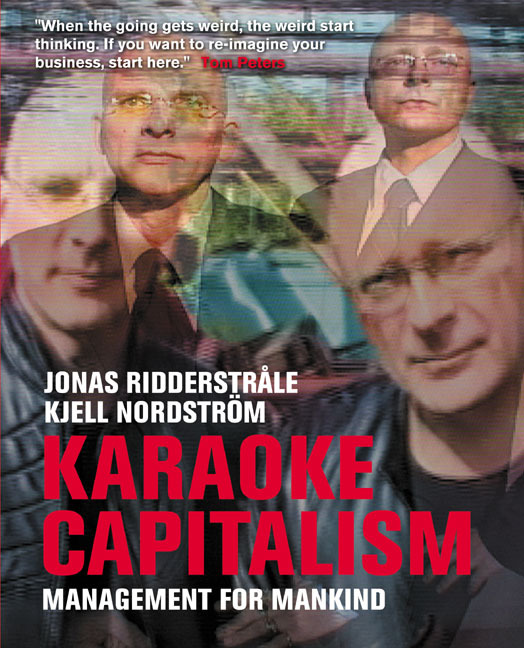 Kjell A. Nordström och Jonas Ridderstråle är parhästarna bakom succéer som Funky Business, Funky Business Forever och Karaoke Capitalism.